I was searching, how to become good player . I found many useful tips and strategies, but I haven´t found any good manual, including whole management, so I decided to make my own. Player should concentrate the most to first points in all areas. Last points are important too, but only if you manage first in row. I am sure, that many good players know most of these points, but they don´t follow these rules in game. It can be caused by stress, concentrating to not important things and leaving their city in chaos. If you play arabia and you see forward gold, it is not good idea to dark rush + fc, unless you can easy wall. If you see, that your enemy has forward gold and stone, you can go offensive to him and tower it. On water map you can galley rush and on maps like bf you usually boom. If you play arena map and see turk, you can try fast imp. You see spain on arena? You can try home conquistadors or castle push. On arabia you can dark rush with aztec, but train scouts with mong. Do you see that enemy is aztec on arabia? Then you can expect dark rush. Do you see he is brit? Then probably his army will include archers and skirms. Do you see your oponent dark rushing you? Then try wall and beat those guys. Do you see enemy scouts? Go make enought of scouts or spears. Watch the time and try predict time of his ups and attack. Do you see archery range in his home? Then look to second building. If it is blacksmith, before second archery range, he probably tries to go crossbowmen or little archers with fast castle up. Did you plan to go scouts and some archers and enemy tower you like mad? Maybe you can go raid his home eko with scouts. Sending villagers on stone isn´t bad idea too. Imagine, you arrive to enemy village. You meet villager on gold in early time and don´t see gathering place on gold? Then he dark rushes. Do you see after feudal up your guy making archery range instead of scouts first? Then he probably goes only archery units and scouts later or ignore them. "DO NOT ALLOW FREEDOM, GIVE STRICT ORDERS"
In feudal age is not hard to have all villagers in their job. Imagine - your berry workers finish their berry and they stay and don´t work. If you watch these guy lazzy guys in time, you can get some extra resources. You can put gathering point to resources, so villagers go to job immediately after they are made. This is one of the most important things. You can be active in fights, but you miss that your town center is not making new recruits. You will get less resources in future and maybe loose battle. Watch your workers. Don´t send too many villagers on wood. If you notice this problem, go make more farms immediately or send to gold. Don´t mind gold or stone, when you don´t need it. Imagine you mined too much gold in feudal age and you are above zero with food. Don´t send many vills on gold and try solve this problem with more farm workers. 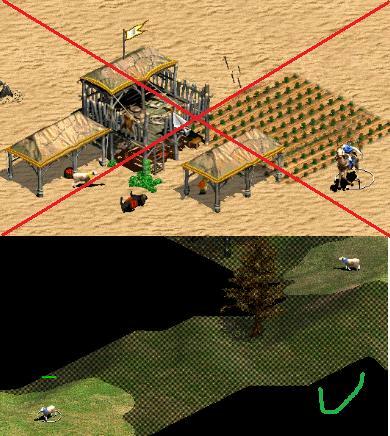 In many games players send their workers cut trees too far from lumbercamp. It can cause loosing extra resources. This problem is normal in imperial age and there it will probably not cause your death. "FIGHT FOR GLORY AND VICTORY"
Do you go boom? Then you don´t need army, if enemy doesn´t attack you. Do you just up feudal age and build 2 ar? Then make archers. Do you go dark rush? Then build barracks max on 19 pop. Does your enemy has indian civilisation? 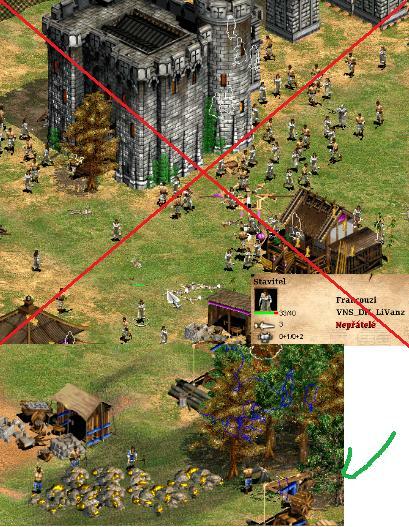 Then you probably don´t need spears or pikemen. Does your enemy has 20 crossbowmen? Then can be mangonel useful. If you make archery ranges in feudal, then you should manage to not stop creation on begin. Only when you plan to stop making this army type. Are you german planning paladins in imperial age? Then you will probably need at least 6 stables. You should make good place for buildings. If you go flush, you can use your buildings as wall. You can hide your military units in garrison or you can send them straight to battle. "IGNORED TECHNOLOGIES CAN BE MORE EFFECTIVE THAN EXPECTED"
1) Up next age in right time. If you go too early, you will have probably weak economy and less army, if you up too late, enemy can kill you with stronger army. 2) Don´t forgot economy upgrades. Also better technology of mining will boost your resources quantity. Don´t forgot to up your units in blacksmith. If you go crossbowmen, making +2 range is good idea. If you get more knights 2+2 armor is good for raiding. In archer rush always make +1 range in feudal age. You can click about 3 times in row and make "flags". Then will scout follow this point, this is good if you scout in circle on begin. You can make same for sheep. This is first important thing in your real scouting. You should find them as fast as possible. Two villagers can build house and next can help search this food bank for your villagers. You see your town centre and make bigger and bigger circles around it, as long as you find these boars and sheep. Usually you find both during searching your animals. If you found all needed resources, go ahead across map to search your oponent. Try to find lumbercamp, gold and mill. Watch out town center! Better is go around corner of map, if you expect tc close. If you look and count enemy villages on resources, in many cases you can see what strategy enemy uses and then you can expect time of enemy attack. If you find enemy mine gold and watch 790 on one gold pack, then you can expect he dark rushes with 3 militia. "GOOD WARRIOR USE BRAIN IN FIGHTS"
Do you have 6 cavalery archers and enemy 10? Then you need more than 10 to fight him face to face. Also watch upgrades of your enemy. If he is late with upgrades, you can beat even stronger army. Do you see your enemy built scouts on arabia? Then you can expect, he will probably attack your resources soon. Does he fast castle? Then he will probably not attack before 17th minute (unless it´s klew or extreme strategy). 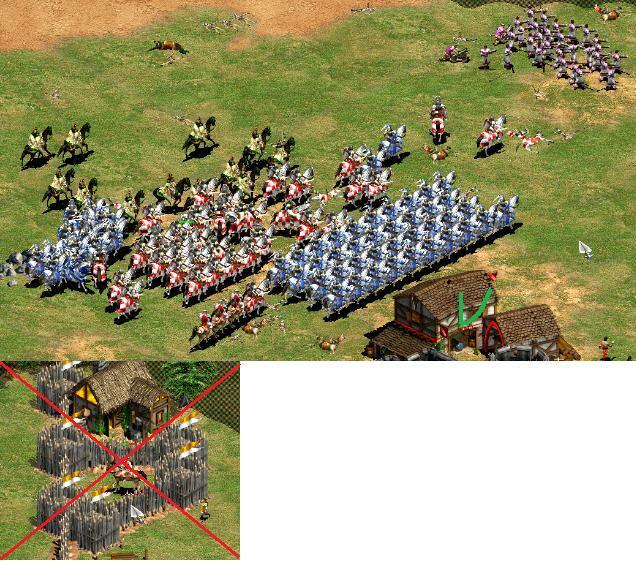 If he doesn´t wall or make towers, you can kill him with your feudal army. If you get group of 3 scouts, you can try hunts first villagers. If you just up castle age, you can fight with archers in time they are upgraded to crossbowmen. 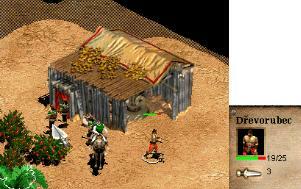 Try attack enemy economy and hunts villagers. Don´t let enemy to devastate your village, in time you are on way to suprise him at home. This is good with shooting units. You can shoot once with your archer group, move and then shoot again. If enemy doesn´t micro, you can rule the better. If you are very well with your management in castle age, you can make two or three groups of knights or ca and attack on different times. If you are fast enought, enemy will probably get in management troubles. "ENJOY YOUR POWER, DON´T HIDE IN TOWER"
If the game is stressing you, just go relax and play other time. If you don´t play for fun, game doesn´t have much sence at all. It is usual that players under offensive attacks are in stress, it can cause many mistakes. Try to don´t get stressed and relax. 3) Don´t look to enemy rating when fight begins. You can be surprised that you beat with your 16xx oponent with 17xx rate. Success is only in right managent of all aspects. Don´t think you can´t win, just because enemy is stronger. You can try difficult micro tricks, or just don´t let enemy think you are prey for him. 5) Don´t be scared to loose points againts stronger players.You can loose many points, when you fight stronger players, but in these fights you reveal your weaknesses and learn to play under pressure. After some time your old same-skill players will be not hard challenge for you anymore. If you loose game, you can find at least one main mistake and more other, that caused you were beaten. If you don´t repeat mistake in next game, you are on your way to improve. Nice work. You seem to have put a lot of work into it. Awesome work man !!! 5/5 . Can't wait for more posts.